A poster for Yu Hua’s works at this year’s Havana Book Fair, which is focused on China. 14ymedio, Luz Escobar, Havana, 8 February 2018 — The young woman walks among the booths selling Chinese literature at the Havana Book Fair in search of works by this year’s star attraction, the writer Yu Hua, who finds a passionate readership on the island. With his criticisms of the censorship imposed on his work by the Chinese government, the novelist also defies the Cuban authorities. Before the astonished glances of some officials present at the encounter, the writer got right to the point: “Censorship has been a constant in my work,” he said. He criticized with particular harshness the film adaptation of his work To Live, taken to the screen by the director Zhang Yimou, which won of the Grand Jury Prize at Cannes in 1994. “[The movie] did not represent what I wrote because so many aspects had to be deleted and changed because of censorship that it was unrecognizable,” he lamented in front of the students of Chinese Language and Culture. The writer believes that the “scissors” applied were stricter because at the time the film was made the officials who controlled the cinema were very severe. Whether because of his skill as a writer, or the discomfort he generates among his censors, Yu’s work has enjoyed great popularity in this year’s Fair. His writing has brought a spirited touch to the event, one in which many Cuban authors are striking by their absence, particularly those who live in exile or who, although they continue to reside on the island, are not looked upon kindly by officialdom, for example the novelist Wendy Guerra. Yu seems to have a lot of experience in gracefully wriggling out of the stilted ceremonies, official honors and autograph signing events. He is one of China’s most important living authors, having sold millions of copies of his works around the world, and has been nominated for the Nobel Prize for Literature on more than one occasion. His best-known work, To Live, narrates a raw and sublime history, which spans the time from the fall of the Chinese Empire and the fratricidal struggles, until the arrival of the Cultural Revolution. Fugui, the protagonist, is both a witness and a participant in the brutal and accelerated change that is shaking his country. The novel explores the limits, or the absence of limits, of the human being in a context where he is overwhelmed and forced to act. His other books, including Chronicles of a Blood Merchant (1998), Cries in the Drizzle (2004), Brothers (2008), The Seventh Day (2013), and China in Ten Words (2012), have had to deal in one way or another with official objections. 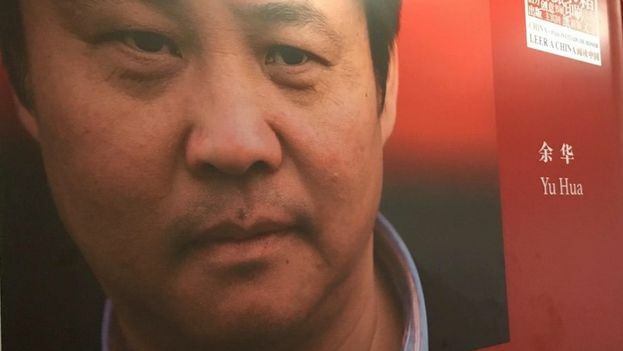 “China will change, the Communist Party will not always govern, there will come a day when China will be truly democratic and free,” the author repeated in his interviews, reinforcing his dissident image in the eyes of the Beijing regime. The son of a surgeon and a doctor, Yu Hua, who had to work as a dentist in an era when few could choose their profession, is an exception in the midst of the boredom of the Fair, whose Guest of Honor this year is China. His works have outshone those volumes with their ubiquitous red covers that detail the politics of China’s Communist Party, filled with pages that sing the praises of the current economic health of the Asian giant. The irreverent author has ended up eclipsing the other 200 writers, intellectuals and officials of his country who landed on the island, accompanied by nearly 7,000 copies of classic and contemporary works published in Spanish, English and Mandarin. On Wednesday, few readers bothered to visit the immense space of nearly 4,500 square feet where you can find in Spanish the second volume of Xi Jinping: The Government and Administration of China , which addresses the policies of China’s current president. Readers are only interested in looking for Yu’s works.